This luncheon menu is heavy on comfort food that I can prepare ahead of time because it was served immediately after a morning of outdoor ice skating. The cheese and charcuterie were one of my more brilliant ideas because they are filling munchies, especially after exercising. While everyone was mingling, I had an opportunity to reheat the chili, pork shoulder, and baguette. The salad was a cinch to put togehter. The only items that require a la minute preparation were vin chaud and smashed potatos. Vin chaud (French version of mulled wine) is one of my favourite beverages after playing outdoors in winter. In retrospect, since the majority of my guests are not into alcoholic beverages (during lunch especially), I could have scratched this from the menu. However, the aroma of the spices and wine was absolutely mouthwatering. The smashed potatos is so easy to prepare yet the result was amazing. I boiled some baby red potatos until tender. The potatos were drained and smashed to small pieces with a rice paddle (trust me, rice paddle is the best utensil for dealing with potatos). As a finishing touch, I mixed in a generous glob of Boursin, a processed cheese spread with garlic and herbs. Voila! Smashed garlic potato in 3 minutes! This dish was very well received. It will definitely be my go-to recipe for potato preparation from now on. The chili is one of the dishes that I regularly cook so it was one reliable choice. The pork shoulder, however, I was quite skeptical. First, I rarely cook meat so my confidence is low to start with. Secondly, I have a tendency to under-season meat. Looking at the beautiful 5lb pork shoulder that I bought from Cumbrae's, I was more than a little hesitant. Luckily, the slow long cooking rendered the pork tender and succulent. The sweetness of the sauce penetrated through the meat and it was actually a little like pulled pork. I'm quite happy with the final result. Happy New Year everyone! May 2007 be another year full of great cooking and baking from Dessert By Candy and you! Making a buche de noel for Christmas dessert is something on my to-do list for many years. However, the prospect of making a jellyroll (which is really what a buche de noel is) had me hesitating every time. The rolling of a sheet of cake just seems so....daunting, for some strange reason. This year, however, I'm determined to overcome my fear of rolling. In the last couple of years, I saw many modern interpretations of the traditional buche de noel from various patisseries in Paris. The clean and minimalistic look of these cakes really inspired me to create my own buche de noel. My take of this traditional cake forgos all the meringue mushrooms, leaves, pine needles, and the look of a tree log for that matter. 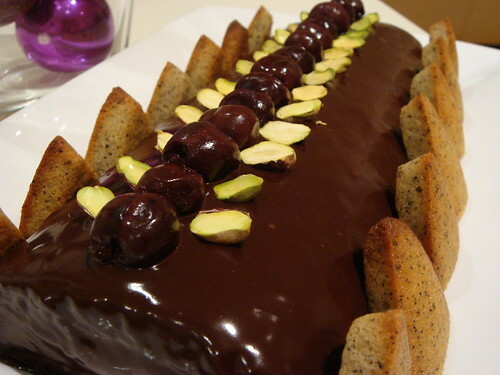 Instead, I opt for a shiny ganache glaze covering flourless chocolate cake, pistachio bavarois, and kirsch cherries. The cake is garnished with Earl Grey financiers, more kirsch cherries, and pistachios. This cake looks deceivingly rich and heavy when it is, in fact, light and airy. It was a delicious end to a Christmas feast. Preheat oven to 350C. Line a 12x17 sheet pan with parchment paper. Beat egg yolks with all but 2 tbsp of the sugar on high with whisk attachment for 5 minutes until ribbon stage. Beat in melted chocolate and ground almonds until incorporated. Set mixture aside. In another mixing bowl, beat egg whites with cream of tartar until frothy. Gradually beat in reserved 2 tbsp of sugar until the meringue reaches glossy soft peak stage. Lighten the chocolate yolk mixture with about 1/4 cup of the meringue. Gently fold in the remaining meringue. Spread the batter evenly in the sheet pan. Bake for 16 minutes until the cake springs back when pressed. Remove cake from oven and dust with cocoa powder. Cover with a damp tea towel and cool to room temperature. Scald milk and 250g of heavy cream with the pistachio paste. In a mixing bowl, beat egg yolks with sugar. Temper the yolks with the hot cream, making sure there's no lumps of pistachio paste. In a small bowl, bloom the gelatin with 3 tbsp of water. Cook the mixture over medium heat like a creme anglaise until the custard is thick enough to coat the back of a spoon. Remove from heat immediately. Melt the gelatin in microwave to a clear liquid using 10 second intervals. Stir into the creme anglaise. Cool creme anglaise in an ice-bath of in the fridge until it thickens. In a cold mixing bowl, whip the second portion of cream to soft peak stage. Gently fold whipped cream into the thickened creme anglaise until smooth. Chill until pistachio bavarois reaches spreadable consistency. Boil cream and pour over chopped chocolate in a mixing bowl. Let it sit for 5 minutes. Gently stir to homogenous state, careful not to beat in air. If there are chocolate pieces that refuse to melt, heat gently over a bain marie until ganache is smooth. Set aside to cool until glaze is thick enough so that when you pour the glaze into itself, the drop pools on the surface a little while before smoothing out. With the aid of another sheet pan and parchment paper, flip the chocolate cake upside down to remove it from pan. Carefully peel off the parchment paper. This chocolate cake is very delicate and soft so that it shouldn't crack when you roll. Spread two cups of the pistachio bavarois evenly on the chocolate cake. On the long edge, stud the cream with cherries. Roll the cake, jellyroll style, from the long edge. Tighten the roll with the help of the parchment paper. Pop the roll of cake into freezer for about 30 minutes. Using a serrated knife, trim the two ends of the roll. Cut the roll in half to make to smaller logs. Place logs on a cool rack over a sheet pan. Glaze the two logs with the chocolate ganache glaze. Place logs on serving plate or cake boards. Garnish with cherries, pistachios, and financiers. Chill in fridge for at least one hour before serving. Without sounding too much like Wallace, I love cheese. For my Christmas Eve dinner (my family does not really celebrate Christmas), I decided to have a dinner of cheese and champagne. I always have a half bottle of "emergency" Moet et Chandon in the fridge, just in case, and today I was in a celebratory mood. I rummaged through my pantry and came up with a whole whack of accompaniment for the cheese including dried apricots, dried sour cherries, roasted unblanched almond, roasted pecans, vanilla poached pears, a loaf of hutzelbrot (fruit and nut bread), water crackers, cream crackers, and a fresh stick of baguette. I'm very pleased with this cheeseboard. It's easy to put together and delicious in every way. I think I'll visit a Polish deli this week and serve a selection of sausages as well for an easy appetizer at an upcoming party. Winter Solstice is one of the most important dates in the Chinese calendar, often given more importance over the lunar new year. On this day, it is typical to have a big feast with family members, a tradition dating back to the days when the first day of winter marked the end of harvest season. Being a Chinese Canadian myself with few family members living in Toronto, the significance of this holiday has long since faded. However, any excuse for a feast is a good holiday in my book. So tonight, in our attempt to avoid the inevitable crowd in most Chinese restaurants, my brother and I decided to go for an omakase meal at Le Cafe Michi instead. Le Cafe Michi is one of the few Japanese restaurants that I frequent in Toronto. Although its offerings are not particularly adventurous, the freshness of the ingredients, their attention to detail, and their convenient uptown location are reasons enough for me to return. 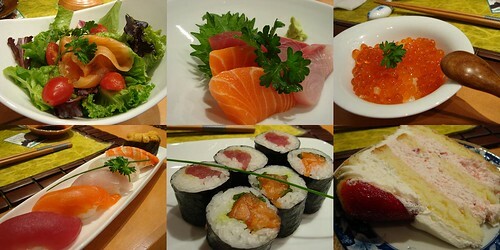 The most memorable dishes of the evening were the ikura don and the salmon maki with shiso. The ikura (salmon roe) used here taste of the rich oiliness of fresh salmon, without the too-often over-saltiness. It was very delicious though very rich at the same time. A few sips of the green tea sure helped to cut the richness. The addition of shiso to the salmon maki was a great touch. The herbal/grassy flavour of the shiso leaf elevated an otherwise by-the-books maki to something pleasantly surprising. I'm glad that the darkest day of the year is finally over. I can't wait to enjoy a little more sunshine everyday until we reach the height of summer when outdoor inline skating will once again be in full swing. I only realized yesterday late afternoon that our annual company holiday potluck lunch would be held today. There was an email sent earlier last week but I must have missed it one way or another. This potluck lunch has become somewhat of a tradition at our office and I certainly don't want to miss it. In years past, I brought in interesting dishes to share so of course I had no intention of going the "store-bought" option this year. Unfortunately, practicing speedskating so many times a week after work also means I am behind in stocking up my kitchen with groceries. By the time I finally made it home, the grocery store was already closed. On the bright side, my pantry is super well-stocked with baking basics after my holiday baking extravaganza. At the stroke of midnight, I found myself frantically flipping through cookbooks looking for something simple yet interesting to bake. 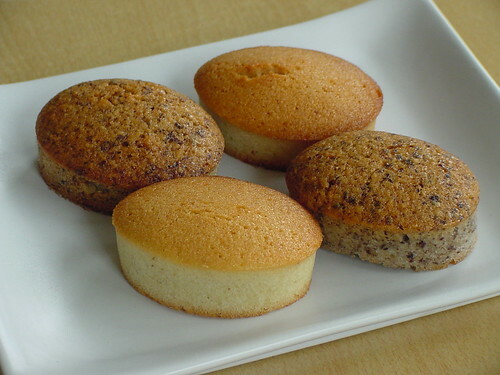 After much consideration, I settled on financier, one of my favourite things to bake and to eat. Not just any financier, mind you. I made a double batch of financier flavoured with Earl Grey tea. This batter can sit in the fridge for several days so now my dessert contribution/host gift for a gathering on Saturday is also solved! Being a little competitive by nature, I hate to see leftovers from my dish in a potluck lunch. When I mentioned this to DN, his reply was quite interesting..."the solution to that is to make less". Hmm, it never occurred to me to think this way! Fortunately, my Earl Grey financiers were one of the few dishes that was all gone. Now I feel much better. I've been going to Tremblant for a few years on the last weekend of the pre-season and had some awesome time on the slopes. This year, due to the mild weather, snow condition was really nothing to write home about (not that it'll stop me to writing about it). Temperature hovered around 0C all weekend and the snow was like slushie with some packed snowballs thrown in. Imagine spring at Blue Mountain and you get the picture. On Friday, I experienced rain, hail, and snow all in the same day. Let me tell you, face mask is a must in hail. I was hit with hail midway down a run and was too lazy to put on my face mask. The faster I went, the harder it hits...man, little ice pellets on the face is painful! I tried to cover up my face with my gloved hands, lost balance, stretched out my arms to regain balance, only to repeat the whole process over again. On Saturday, it was sunny outside so I was all excited to hit the slopes. 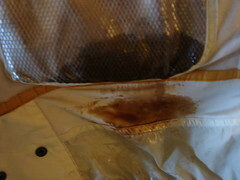 I even packed my jacket with a Vector bars and a chocolate Powergel for midday refueling. I was riding with a small group and it's always fun to race each other down a run. I was hanging back about 10-25m behind ML for a long time and was ready to accelerate. I must have gotten lazy with my edges though because next thing I knew, I caught on my toe edge and was tumbling down hard, hitting my bruised rib yet again. Unfortunately, my rib was not the only casualty in that fall. Apparently, the impact was big enough that the Powergel exploded in my pocket causing a mess of stickiness all over my jacket, my snowpants, and my fleece pullover. Yuck! That was it for me to head back to the condo for some serious clean up. Sunday was a short day for me. I originally did not plan to ride on Sunday but since one of my friends decided to pass, I bought his ticket from him. I know that Tremblant can be cloudy and foggy but riding in the fog with only 5 feet of visibility was more work than fun. It certainly didn't help that people still decided to sit in the middle of the trail. I had to make a few emergency brakes and shape turns to avoid these human pylons. The trail was very bumpy with lots of snowballs and mogols. I don't think they even got around to groom the trails. A little disappointed by how little snowboarding I managed to do, I did have a good time at the village. 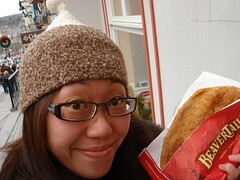 Enjoying a BeaverTail is of course a Tremblant tradition. My favourite is the Killaloe Sunrise with its topping of cinnamon sugar and lemon juice. I was happy to see that the pastries here are made fresh to order unlike some other branches. Eating a piping hot deep fried pastry in the somewhat cold outdoors is just so winter, you know? Ever since I was introduced to the goodness of Quebec cidre de glace a few years ago, I've made a point to pick up a bottle or two every time I'm in La Belle Province. This time is no exception. I bought a bottle of 2005 Domaine Pinnacle Ice Cider and a bottle of 2006 Domaine Pinnacle Sparkling Ice Cider. I'm looking forward to enjoy them this winter. Creperie Catherine is another restaurant that I return to year after year. It is one of the most affordable restaurants in the Tremblant village and the wholesomeness of sweet or savory crepes after a day on the slope just hits the spot. 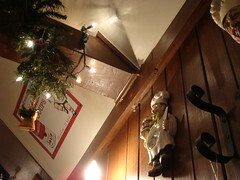 I love the knick knacks decorating the restaurant interior, all the cute paraphernalia donning chef touques. I enjoyed a hearty crepe Benedictine with two eggs, Black Forest Ham, crab meat, Swiss cheese, and bechamel sauce. It was big enough for two to share. The sucre a la creme is a house specialty as well. I bought a jar of this caramel sauce made with brown sugar and I'm already dreaming up of ways to use it in my dessert creations. Last but certainly not least is the Oberoi Express. 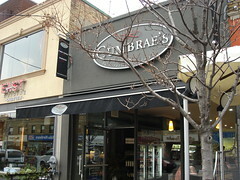 I always stop here on my first night at Tremblant for artisinal bread, local cheeses, and pate. A boule of the delicious chocolate and date bread and a wedge of Le Migneron de Charlevoix cheese were great treats for both breakfast or after-ski snack. I hope we'll enjoy better snow condition this time next year. 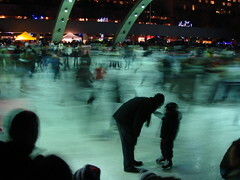 Snowboarding season is finally here even though the weather has been unusually warm in Toronto. I cannot even get into the mood of thinking of snow when it is raining and 10C outside. Hopefully the condition at Tremblant will be okay. If not, I'll just have to take it as a relaxing vacation. See you back in a few days! This year's cookies packaging was a mish mash of using up all of the boxes, paper, and ribbons from previous years. Inspired by the 3-tier Japanese boxes that I used for the larger gifts, I decided to go for a Japanese theme for the packaging. The corrugated cardboard box seen on the right here is very sturdy so it is great for protecting more delicate cookies. 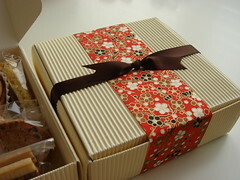 The wide band of washi (Japanese paper) has a winter flower motive in white, black, brown, and gold. It adds a pop of colour to an otherwise plain square box and keeps the lid close. The rich brown satin ribbon adds warmth to the whole colour combination. 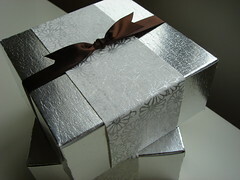 When I ran out of the cream colour cardboard boxes, I use a silver cake box that I bought a while back. This kind of boxes is typically used by Indian sweets stores for mithai. In fact, EC and I bought these boxes from one of these stores. By itself, it can look a little tacky. However, I added a band of white washi with a silver crysanthemum pattern for a cool winter theme. The brown satin ribbon balanced the colour scheme from getting too washed out. Most of the cookies are individually wrapped in cellophane bags. The practical reason is to prevent the grease from the cookie to stain the boxes and also to keep soft cookies separate from crisp cookies. Now that my stash of packaging supply is almost gone, I have a whole year to stock up before next year's holiday baking begins again. 15:45 get my nails done at salon next door. This is only the second time ever that I wear nail polish because my hands are in miserable shape from the holiday baking. 16:30 get my make up done by Christian Dior make up artists. Woohoo for free promotional events! Love love love the funky look...must be the strong purple in the eye and the blue tint in the lips. 17:15 put on dress, necklaces, stockings, and shoes. Pack my evening purse and don't forget the perfume. 18:00 all done! Out the door! It was a lot of fun to step out of my every day persona for a change. That's me with DN just before I left for another party with a few friends. 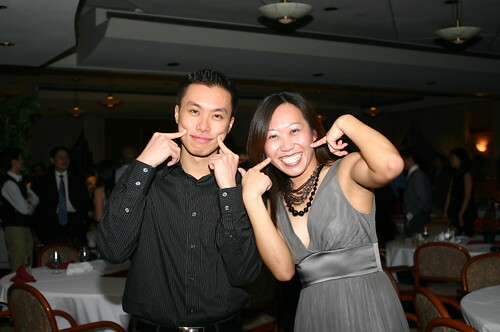 I wanted a goofy picture so I said let's do the sunshine....DN was a good sport and reluctantly agreed. The picture came out goofy as expected but I really liked it because I looked so happy and he looked so embarrassed. Edited 12/13/2006: A few people have asked me where I got the dress. It was made by Helen Wang and I bought it a couple of months ago at Mendocino, a local boutique in Toronto. Wang's fall/winter 2006 collection has a number of similar empire waist pleated chiffon dresses which are very flattering to most body types. 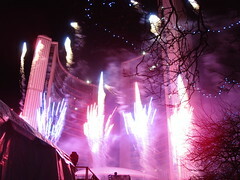 I went to Nathan Phillips Square on Saturday evening to check out the Calvacade Of Lights. I had such a good time because it was one of those occasions which the company is more important than the activity but it certainly helps that this is an activity that I enjoy. 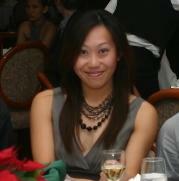 I love to be surrounded by the festive atmosphere yet not quite being a part of it. It felt like I was embraced by the excitement emmanating from everyone around me. I do love to stare at bright lights such as twinkling Christmas trees and fireworks. I felt so lucky that I was walking around with someone who didn't mind sharing my silly fascination for an evening. The chill in the air and the brisk wind did not bother either. Rather, they reminded me my favourite season is finally in full swing. I love winter in Toronto.